Today, Ms Vanessa Holt met with the Right Worshipful Provincial Grand Master and the Most Excellent Grand Superintendent, to inform that she will be retiring on 31st December 2018, after having served the Province loyally for some 27 years. A Blue Plaque has been unveiled in Bargoed to commemorate the involvement of Freemasonry in the community. Ken Verlander (pictured right) of Gelligaer Lodge was invited to join the South Wales Assistant Provincial Grand Master Marc Lewis (pictured left) in the task of unveiling the Blue Plaque. The plaque proudly shows that freemasonry has been a part of the local community for 72 years, since 1946. The Gelligaer Lodge was established in May 1946 and meets on the second Monday from September to June. Ystrad Mynach Lodge has also been meeting in Cardiff Road, Bargoed since February 1974, on the fourth Wednesday of September, November , January, March and May. Both lodges are very active and raise significant monies for local charities. 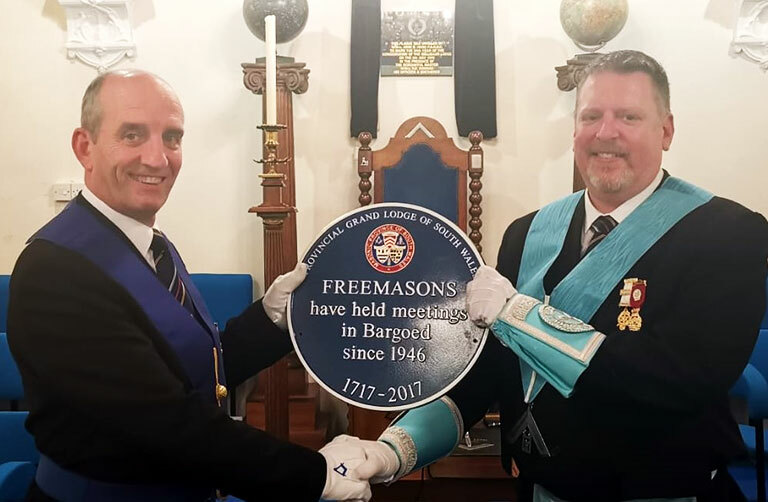 South Wales Freemasons have been celebrating the Tercentenary 300 years of Freemasonry within the United Grand Lodge of England, and are affixing Blue Plaques to many of its’ Masonic Halls across South Wales. Early records exist of Freemasonry within the current South Wales region being established in Cardiff & Cowbridge in 1754. The latest grant to Wales Air Ambulance from South Wales Freemasons brings total UK donations to £2.3 million. 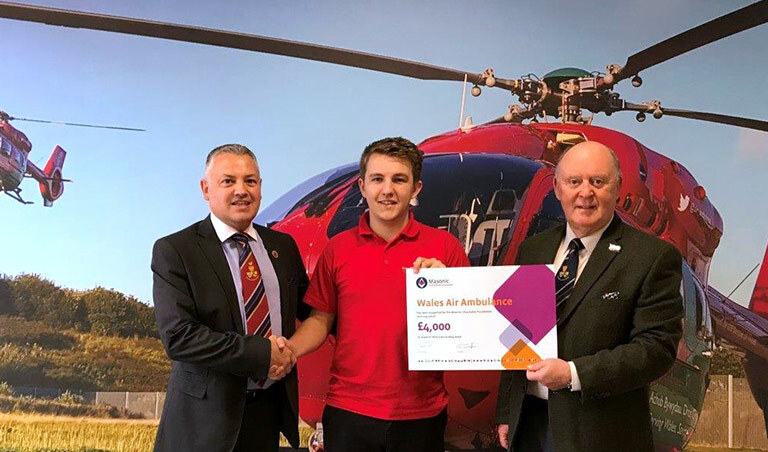 A grant of £4,000 to the Wales Air Ambulance from South Wales Freemasons has brought the total Masonic support given to air ambulances across the country to £2.3 million since 2007. The Air Ambulance operates right across South Wales and has made many life saving flights so far this year, transporting seriously injured people to hospital and treating patients on the ground.